Pope Benedict XVI warned yesterday that gay marriage is one of several threats to the traditional family unit that undermines “the future of humanity itself”. 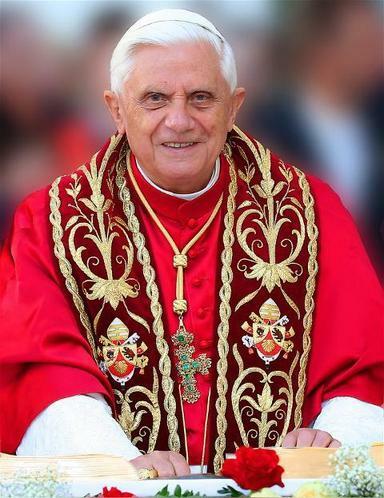 Pope Benedict XVI told diplomats from nearly 180 countries that the education of proper of children needed proper “settings” and that “pride of place goes to the family, based on the marriage of a man and a woman”. The pontiff made his comments, some of his strongest yet against gay marriage, during a New Year address to the diplomatic corps accredited to the Vatican. During his speech, Pope Benedict touched on some economic and social issues facing the world today, including gay marriage. The pontiff said: “This is not a simple social convention, but rather the fundamental cell of every society. “Consequently, policies which undermine the family threaten human dignity and the future of humanity itself. The family unit is fundamental for the educational process and for the development both of individuals and states. One leading opponent of gay marriage in the U.S. is New York Archbishop Timothy Dolan, who Pope Benedict will elevate to cardinal next month. Timothy Dolan fought against gay marriage before it became legal in New York state last June, and in September he sent a letter to President Barack Obama criticizing his administration’s decision not to support a federal ban on gay marriage. In that letter Timothy Dolan, who holds the powerful post of president of the U.S. Bishops Conference, said such a policy could “precipitate a national conflict between church and state of enormous proportions”. Gay marriage is legal in a number of European countries, including Spain and the Netherlands. Some Churches that have allowed gay marriage, women priests, gay clergy and gay bishops have been losing members to Catholicism, and the Vatican has taken steps to facilitate their conversion. In 2009, Pope Benedict XVI decreed that Anglicans who leave their Church, many because they feel it has become too liberal, can find a home in Catholicism in a parallel hierarchy that allows them to keep some of their traditions. The Vatican has since set up “ordinariates,” structures similar to dioceses, in Britain and the U.S. to oversee ex-Anglicans who have converted and be a point of contact for those wishing to do so.